Do you want to know what the mysterious sounds of the old 19th Century Banjo sounded like as written in the ORIGINAL source of banjo music? Do you want a base from which to create your own interpretations? This collection includes all the banjo instrumentals from the principal tutorial books published between 1855 and 1872 including the banjo section of the Converse Analytical Method of 1887. 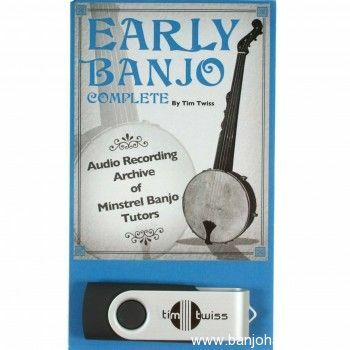 This collection of early instrumental banjo music also includes PDF files of the original tutors so you can see the music as it was written 150 years ago. Briggs' 1855 56 tunes, Rice 1858 35 tunes, Buckley 1860 117 tunes, Winner's 1864 27 tunes, Yellow Converse 1865 27 tunes, Green Converse 1865 77 tunes, Buckley 1868 91 tunes, Converse 1872 31 tunes, and the Converse Analytical of 18877 33 tunes. The selections are all played unaccompanied on a Fretless Boucher banjo tuned to D. The interpretation was intentionally left unadulterated in order to provide the listener with a simple baseline recording library, faithfully representing the written page. This ad will automatically expire 5/19/2019 3:40:45 PM unless updated before that date. To keep the system current, ads expire if not updated for more than 60 days.